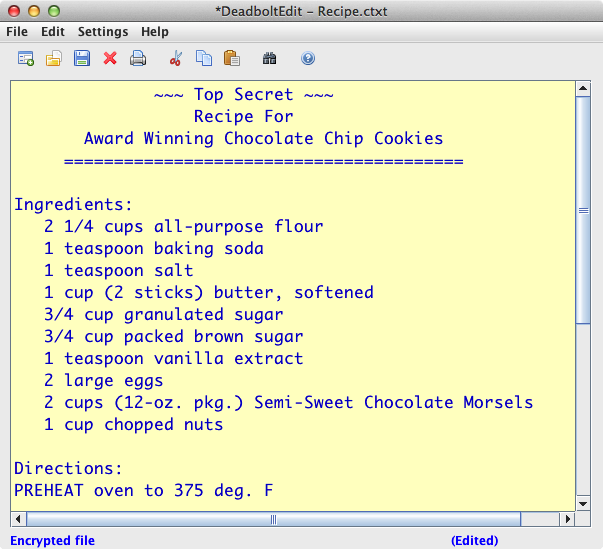 DeadboltEdit is a basic text editor that uses strong encryption to store files. The program can be used to safely edit and store sensitive information, such as website login information and other personal information, that you would not want disclosed if your computer is stolen, compromised by malware, or used by other people. Encrypted notes can also be used as e-mail attachments; you can send them to another DeadboltEdit user. Cross platform - versions for Mac OS X™, Windows™, and Linux™. Easy to use - Encryption is integral and seamless. Just save the file, and enter a password when prompted. Encrypted note files can be shared between Windows, Mac, and Linux systems. Secure handling of encryption passwords. Passwords and encryption keys are never stored anywhere. Passwords are internally encrypted while held in memory, except for the brief time they are used to generate encryption/decryption keys. Blowfish encryption is compatible with the OpenSSL implementation. (not file compatible with OpenSSL) For more information, please see technical article "OpenSSL Compatibility".